One of the nation’s most recognized thinkers and activists in the nonprofit sector is Buzz Schmidt, who founded an entrepreneurial start-up called Philanthropic Research, Inc.—doing business as Guidestar—back in 1994. Schmidt is currently a visiting scholar at the Tuck School of Business at Dartmouth College. He is the founder of GuideStar and GuideStar International, the chair of the F.B. Heron Foundation and (importantly, in the interests of full disclosure) the Nonprofit Quarterly, and a member of the boards of TechSoup Global and the Institute for Philanthropy. 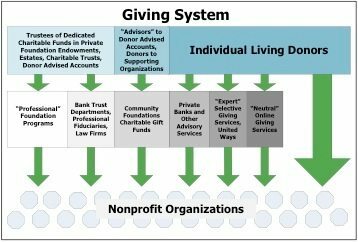 The evolution of his thinking about the nonprofit sector is reflected in his frequent presentations and writings, including this piece he wrote for the magazine Alliance on the challenges of increasing online philanthropy. He describes the giving system as hampered by the unaccountability of donor principals. For example, he points to the lack of consequence for private foundations in terms of whether they make good or bad use of their five percent distributions. “A philanthropy ecosystem that lacks an accountable resource allocation process is by definition sub-optimal,” Schmidt writes. “We cannot expect non-profit organizations to function effectively if donor principals, particularly institutional donors who are looked to as powerful ‘experts’, are fundamentally unaccountable.” Surveying the landscape for important contributors to improvements in this part of the philanthropic ecosystem, he endorses the ideas of the Center for Effective Philanthropy, which he describes as focused on grantee satisfaction, and the National Committee for Responsive Philanthropy, which he describes as more focused on the content of foundation grantmaking. Getting toward outcomes and reporting, Schmidt endorses the Charting Impact initiative of Independent Sector, the Better Business Bureau Wise Giving Alliance, and Guidestar as a useful step. On nonprofit evaluations, he looks toward the development of “intelligent systems” through which “donors will one day manipulate data and generate their own custom ‘evaluations’ of non-profits.” In efforts to improve each part of the ecosystem, Schmidt finds opportunities for social entrepreneurs and innovators to take things to the next level.